This car, thought the one used in the alleged kidnapping of a 7-year-old girl, was found Monday in Norman. (CNN) -- Oklahoma authorities are determining whether two bodies found Monday are those of a murder suspect and his wife's missing 7-year-old daughter, a spokeswoman for investigators said. The bodies and a car authorities said was used in the kidnapping of the girl were found in a heavily wooded area in Norman, outside Oklahoma City, said Jessica Brown, spokeswoman for the Oklahoma Bureau of Investigation. Lester Williams Hobbs, 46, was charged in the death of his estranged wife, Tonya, and the kidnapping of her daughter, Aja Daniell Johnson. Hobbs and the girl have been missing since January. Brown said the bodies are those of an adult and child, but positive identification has not been made due to decomposition. "There's no reason to believe it's not" Hobbs and the child, she said. The medical examiner will attempt to identify the bodies using Hobbs' fingerprints and Johnson's dental records, Brown said. The cause of death was unknown, though a note found near the car described what happened, she added. The details of the note were not released. 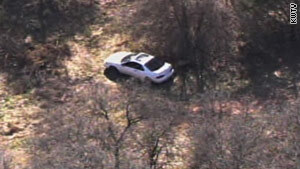 The car had been left in the woods for several weeks, possible a month, Brown said. The search for Hobbs and Johnson took investigators through Oklahoma and Texas. Lester Hobbs is not Johnson's biological father and has an extensive criminal history, police say. Johnson's biological father was awarded emergency custody of her in November, according to Oklahoma County District Court documents obtained by CNN affiliate KWTV of Oklahoma City. At a hearing, Tonya Hobbs -- identified as Tonya Dunkin in the documents -- and the girl's father, John Johnson, agreed that she would have supervised visitation with the girl and that she would keep the child away from Lester Hobbs, the documents said.